Hi stampers!! Happy Friday to you all and welcome to Mrs. Lincoln's Inkin' Friday Video!!! 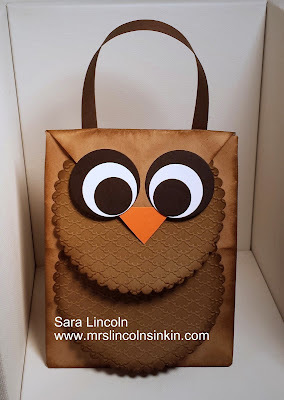 A couple of weeks ago i did a 5 Days of Halloween series and within that week i posted this Owl Treat Bag. Well, i had so many people ask me how i actually made the bag that i thought i would do a video to show you! If you would like to take a look at the first original post click Here. Let's go ahead and take a look at today's Friday Video.